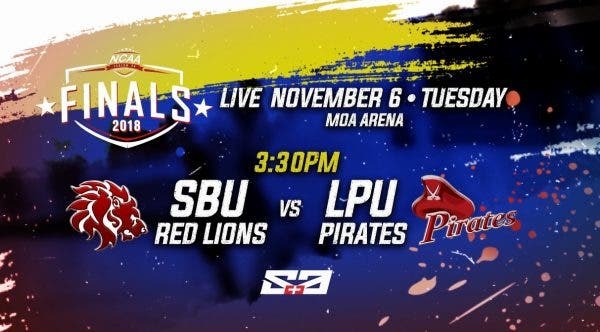 Defending champion San Beda University Red Lions (SBU) and Season 93 runner-up Lyceum of the Philippines University (LPU) Pirates duel for the NCAA title anew this Tuesday (November 6), which will air LIVE from the Mall of Asia Arena in Pasay City on ABS-CBN S+A and S+A HD at 3:30 pm. The rematch features the last battle for star seniors Robert Bolick of the Red Lions and CJ Perez of the Pirates who both want to ride into the sunset as a champion before they jump to the professional leagues. Last season, LPU ran roughshod over the competition, earning a historic sweep for their basketball program that has languished in the cellar thanks to the magnificent play of the Marcelino twins Jayvee and Jaycee and foreign reinforcement Mike Harry Nzseusseu, coupled with Perez’ MVP season. They got swept however in the Finals as San Beda cranked up their game and relied on their championship experience to raise another banner, their 21st. This year, LPU ran into a few bumps in the elimination rounds from the likes of the Red Lions, the Season 94 hosts Univ. of Perpetual Help Altas, and the Letran Knights. However, they displayed why they still remain to be the best team to give the Red Lions a Finals scare when they crushed Letran in the Final Four, 109-85. Will this year be different for Perez and the Pirates? In an interview on “The Score,” LPU head coach Topex Robinson said his team relishes the opportunity to have another shot at the title after last year’s debacle, believing his team is the underdog in the Finals rematch. “We know our why, and our why is about our purpose. What worked for us against Letran is not looking at Letran, but looking at ourselves, how we can be solid as a group. Time and again, in the three losses we had in the elimination, it was about the agenda. We changed it approaching the Final Four and asked ourselves what is the purpose. It’s our own drive, to be known as a program,” shared Robinson. Meanwhile, the SBU Red Lions have been in tip-top shape since the start of the NCAA’s second round. Superstar guard Bolick has been masterful this season in controlling the Red Lions’ offense as well as anchoring its perimeter defense. The surprise for the Red Lions have been their bench, which has seen huge contributions from rookie James Kwekuteye and versatile forward Calvin Oftana, allowing their other main guys like Javee Mocon and Donald Tankoua to have ample rest for the stretch run to the Finals. The defending champs were saved twice in last year’s Finals by Bolick, who came up big during the clutch moments en route to a sweep. While he has all the help a player can have in his supporting cast, all eyes are on the King Lion as fans and basketball aficionados look forward to more of Bolick’s end-game heroics in his swan song. Don’t miss the NCAA Season 94 Finals Game 1 this Tuesday (November 6), LIVE simultaneously on S+A and S+A HD starting at 3:30 pm LIVE from the Mall of Asia Arena. For more sports news, follow @ABSCBNSports on Facebook, Twitter, and Instagram or visit sports.abs-cbn.com.